Walking through downtown Redwood City? Look down to be pleasantly surprised. The non-profit Redwood City Improvement Association is spending $30,000 on public art installations. The first half of the project features San Carlos graphic artist Damon Belanger. "The theme here is shadows," says Belanger. "I've taken that to mean transformation and the unexpected. 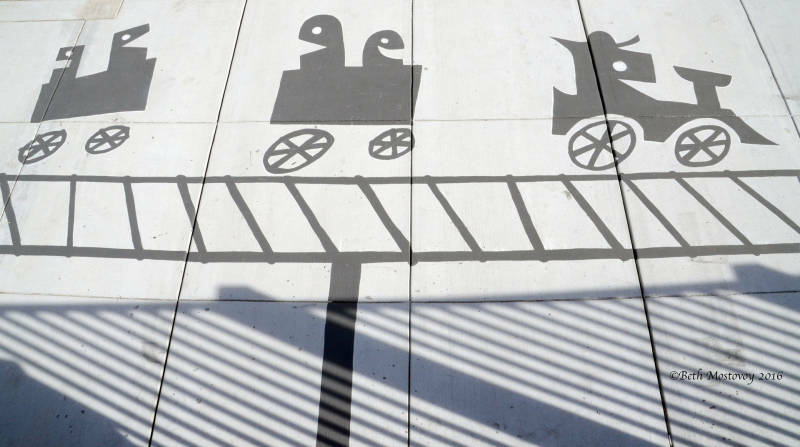 You don't pay much attention to shadows unless you see something unexpected." "People come up and immediately get it," he adds. "They come up with ideas of their own." Belanger's not doing all this work by himself. He draws a chalk outline with a stencil, then relies on the kindness of numerous friends, including his wife and the committee members who chose him to help paint in between the lines. "I grew up watching a lot of Warner Brothers cartoons, as well as reading and watching Japanese anime and manga," Belanger says, reflecting on his influences. "Robotech was a popular series when I was a kid, a Japanese anime translated for American audiences. I also enjoyed Transformers, which was based on a Japanese toy line. The last two had a heavy emphasis on robots. Cartoons have been my core competency since I was a kid." Naturally, his influences expanded as he matured to include artists like Takashi Murakami and others in the Western cannon. "I think this mix of influences comes through in the playfulness of the shadows and of course the recurring robot theme. 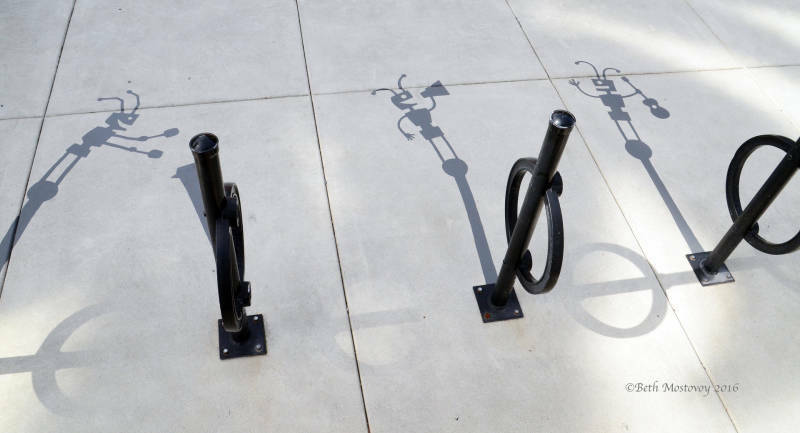 Redwood City wanted something whimsical and fun, something that appeals to everybody." Eric Lochtefeld, president of the board for the Redwood City Improvement Association and the owner of the Fox Theatre, is one of the people who worked behind the scenes to make this artwork happen. "We think there's a great opportunity to build a bridge to an artistic community that's large and thriving." Lochtefeld says. "We had quite a few local artists that applied for the grant." Lochtefeld wan't on the committee that picked Belanger's art, but he likes it. "It's whimsical, magical. It's fun. I think it's a good fit for Redwood City." Belanger was also chosen to put up the project's second public art installation, an interactive wall mural, later this year. Lochtefeld says "What we're asking for at the moment is people to offer up their walls. We're looking for walls right now." 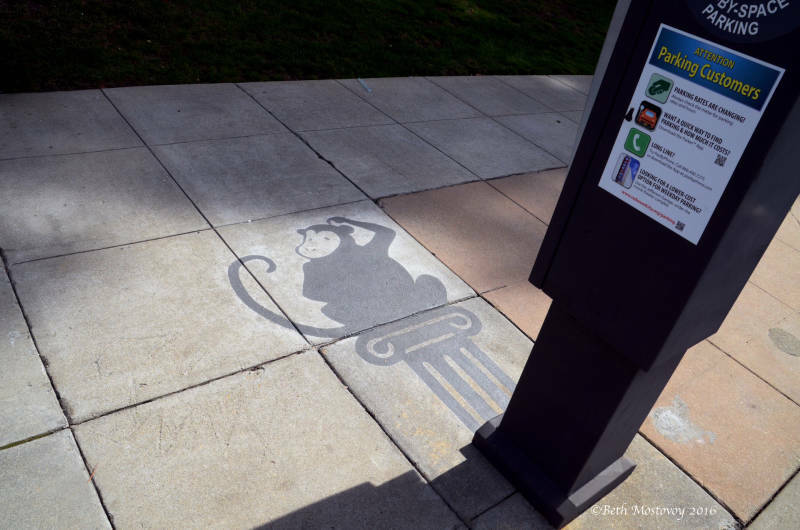 Will the street stencils last forever? "Nothing is truly permanent," Belanger says, but he did use paint designed for concrete patios.